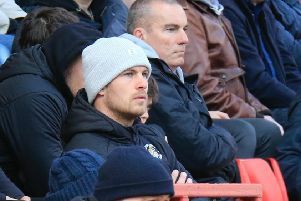 Luton Town boss Nathan Jones has warned his side to be wary of the threat possessed by Crewe Alexandra’s experienced forward pairing of Chris Dagnall and Ryan Lowe this afternoon. The duo have scored over 300 goals between them during their lengthy careers, with Lowe, 38, top scorer for the Railwaymen, having netted six times already this term. Jones said: “They haven’t made massive changes this season, they’ve signed one or two, especially the front two, Dagnall and Lowe. “They’re very clever, they know this level inside out, they’ll be a real threat. “I know them very well, I’ve played against them from their time throughout the league. Crewe have made a decent start to the season too, sitting just one point and three places behind the Hatters after being relegated from League One last season. On their opponents, Jones added: “They’ve got a good structure, they’re coached, they’re not a fly by night team, having come down from last year, they’ll be a dangerous side. “He’s (Steve Davis) not a manager I know, but he’s been at Crewe for a while and is a very good coach. “His side will be a difficult nut to crack and a difficult side to beat, but we have to concentrate on our strengths and have to make sure we play as we can, with the energy, enthusiasm and quality that we know we can. “Then if we’re beaten by a better side then so be it, but as long as we turn up, I’ll be happy, as we believe we’re a good side and now we have to show that. “As I keep reiterating, I’m more concerned with us and at times when we don’t win games, we haven’t been us.